It was bound to happen sooner, rather than later. After umpteen-zillioin kid sleepovers, the sleeper sofa in the rec room has sprung its last spring. This sleeper, having to bravely endure the toll of giggling gaggles of teen girls and rambuncious boys, full of energy to spare, fought a noble fight. In truth, I had a sneaking suspicion that the downstairs sleeper would be the first casualty among our home furnishings. Without a doubt, a high energy round of creativity during my son's last sleepover party, complete with king of the (sofa) hill and plenty of unbounded joy (read: jumping) during video game play was the catalyst in its demise. Time to do some furniture shopping! Although this Mom never shirks from a much appreciated excuse to do a bit furniture shopping, more often than not, my shopping budget is not always a ready team player. Having the benefit of lessons in home decorating and creating new looks without breaking the budget from my own dear mother, I can make some simple changes to a number of rooms and shop for the new furniture I really want: a new living room set! Move the not new living room set to the kids' rec room. Although our current living room set is fairly new, it was purchased for the condo, as opposed to our new house. Covered in microfiber fabric and with motorized recline, the pieces currently in my living room are oh, so comfy but not as formal as I would select and are showing a couple years of wear. Moving both the couch and love seat to the kid's rec room will provide more seating (and sleeping) space than the sad, sagging sleeper sofa currently allows. A perfect solution for this Mom: as opposed to purchasing new sleepers or futons for the kids' space, I'll rotate what I have and purchase the new living room set I really want, eliminating the need to purchase two new sets in the near future! Deciding on a new style for my formal living room will be the challenge. As with most larger purchases, I love the ability to shop online, comparing products, prices and offers. My schedule rarely permits driving all over town to shop. I love the convenience of browsing online, mulling over furniture options while at home, making it easier to gauge how well a new item will fit in with my existing decor, style and future visions. Graceful and full of personality. With a plan in place to appease my shopping budget, the only challenge left will be to decide the style in which I'll dress the formal living room. Something simple, with clean lines, allowing me a great deal of flexibility in accent pieces? 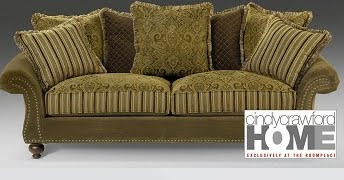 A stylish sofa, full of grace and personality that will determine the theme and feel of the room? Sleek and sophisticated Eco Leather - setting the tone. Recently, I've been exploring collections of eco-friendly furniture; a win-win in this Mom's decor book, creating a rich and inviting look, responsibly. I love the Eco Leather sofa pictured above, with its interesting lines, inviting shape and the ability to easily change the feel of my room by simply changing accents. While the kids have the run of their rec room, this Mom's formal living room is off limits to monkey play. Purchasing quality furniture for this room means I'll likely be inspired to change the look long before the furniture needs replacing. 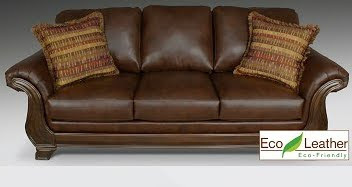 eco-leather is a synthetic leather blend of recycled leather and fibers. 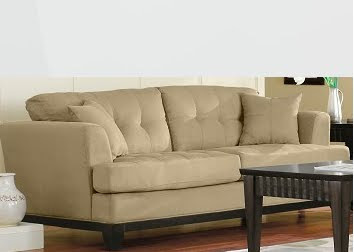 Purchasing new furniture for a new look for your room is your biggest expense. Choose based on style, lines and durability of fabric. Other elements in your room, such as wall decor, window dressings, throw pillows and paint color, as well as smaller display items can be changed at much less expense, allowing you to create a whole new look in your room for less. Do you have any home decor tips? Have you incorporated any eco-friendly elements into your home's decor? Please see my disclosure policy. Images sourced from TheRoomPlace.com. The opinions above are both honest and my own. I loved every picture your posted...does that make my style eclectic? I work within a budget and pick the largest items first. No sense in corner myself in with accessories that I might not be able to furniture match. I also hate it when the walls match the sofa perfectly - I'm not afraid of color but too much of the same one is overkill and makes for a very boring room. I'd love a red or purple couch with opposite rugs and pillows...maybe even walls! I like over stuffed couches. I have no idea what style that is. I did like the second picture of the couch. 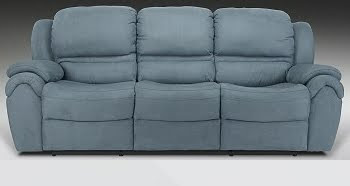 My mom had a leather couch and I always stuck to it when trying to get up. I do like browsing on line and then going to see them in person to narrow down my choices. Well that must mean im Sleek and sophisticated lol. We have two rooms both with leather settees. I just love the feel of them and how cool they feel.